I love crochet. It’s fun and easy to do with a sleeping baby on top of you. I just have one problem with crochet. Whenever I start a new project I will get three or four rows in and think that it looks nothing like what I am supposed to be making. About half the time I will decide that I’m doing something wrong and rip the whole thing out and start over. But if I can just be patient and go a couple more rows it magically starts looking right. Unless of course I did do something wrong. Then I have to rip out even more rows. 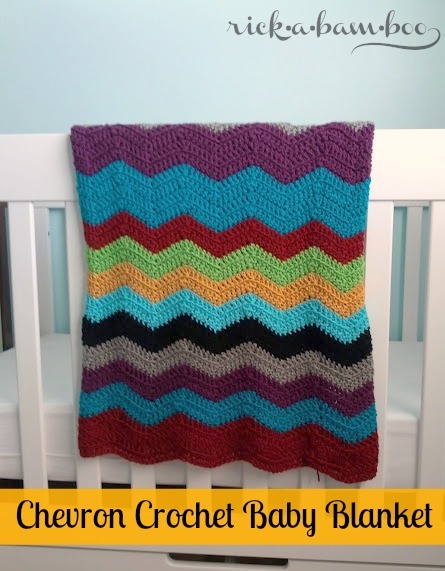 I found this cute pattern for an ode-to-Missoni chevron baby blanket and I thought it would be a fun and (fairly) quick blanket to crochet up. Why do I always think things will take less time than they do? I always think “this will be quick” and months later I’m still working on it. Maybe it’s because I have crafters ADD. I love to buy the supplies and start the projects. It’s the following through and finishing up that I have a problem with. Just ask my craft room. I found the pattern and while I was still on a new project high I went to Hobby Lobby and picked up eight skeins of I Love This Yarn. The colors I used were: black, cranberry, grey beard, limelight, mixed berry, peacock, sungold, turquoise. It turned out beautifully. Plus I have a ton of yarn left over for other projects. I planned on giving this one to a friend as a baby shower gift, but that shower is long gone and the baby has been here for months. Ooops! I guess I’ll just stash it away for the next baby shower. Don’t worry. It really does crochet up quick. It has literally been sitting in it’s unfinished state with 10 rows to go for about five months now. So I am sure yours will go faster than mine. Unless you have crafter’s ADD too. Wow you are so talented. That is darling! Wow, amazing! I wish I had the talent for something like that! It is beautiful! Wow – this is lovely. I have never been able to figure out how to crochet – looks fantastic! Cool! I haven’t crocheted in forever! This looks cute & easy! Very nice work! My Mother-in-Law did some of this style before she passed away. She tried to teach me but I’m all thumbs!